The second generation Tesla Roadster sent shockwaves in the automobile industry with its raw looks and beastly performance figures without guzzling fossil fuel. The sheer speed and power of the Tesla Roadster are impressive, but there is a new entrant to the domain that dwarfs the Roadster in looks, smart features as well as performance. Meet the Rimac Concept Two (or C Two), an all-electric car from a small Croatian company, which made its debut at the Geneva Motor show this week and left sports car enthusiasts fanboying over it. The Rimac Concept Two not only boasts the sleek looks of a hypercar but also has the raw performance figures to be recognized as a legit sports car. It is powered by four electric motors that can produce a torque of 2,300Nm, allowing the car to clock 0-60 mph in just 1.85 seconds and reach a top speed of 258mph. On the other hand, the second-gen Tesla Roadster reaches 0-60mph in 1.9 seconds and has an approximate top speed of 250mph. The Rimac Concept Two cruises on a 1,914-horsepower engine set-up and has an impressive range of 403 miles on a single charge, while its battery pack can be juiced up to 80 percent in just 30 minutes with a fast charger. Rimac is marketing the Concept Two as not just a sports car, but a blend of automobile expertise and modern technology which has Level 4 autonomy. The Rimac EV has over 400 sensors in the car which include radars, LiDAR, ultrasonic receptors as well as eight cameras, which are used in facial recognition for unlocking the doors and firing up the engines. Passenger detection, attention monitoring, and automatic ride mode selection are among the multitude of intelligent features that the car comes loaded with. 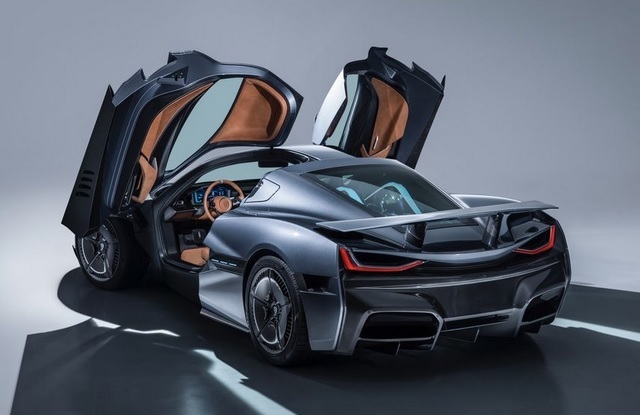 Rimac aims to produce just 150 units of the Concept Two and has priced the electric hypercar at approximately $3.18 million, which is way above the $200k price tag of the Tesla Roadster it is being compared with.